Daiwa Tatula CT Type-R baitscasting reels. Featuring a new, compact ergonomic design, the Daiwa Tatula CT Type-R casting reel is now lighter than ever before. 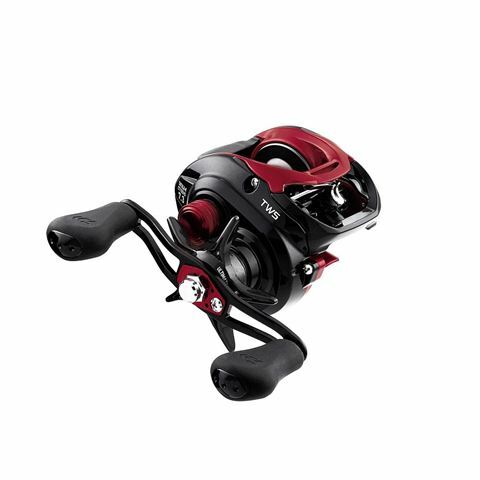 Packed with tournament-caliber features including Daiwa’s advanced TWS T-Wing system and Magforce Z Cast Control, it also comes loaded with an eight bearing system (2CRBB+5BB+1RB) for incredibly smooth and refined performance. Also equipped with a large, extra strong drive gear to turn the heads of big fish, the Ultimate Tournament Drag System dishes out 13.2lbs of max drag and stays silky smooth to slow fish down. The Tatula CT Type-R’s advanced TWS T-Wing System solves an age-old problem with casting reel levelwind systems, greatly reducing friction and harsh line angles during casting. It allows line to flow freely through the wide, top section of the T-wing system during the outcast, and on the retrieve, the line drops into the lower channel of the T-Wing for even distribution across the spool width. The Magforce Z Cast Control System also delivers complete cast control for a wide range of lures and fishing conditions. Everything you need in your go-to reel, the Daiwa Tatula CT Type-R Casting Reel just keeps better and better.